For more information regarding booking a performance, please contact the school at (781) 397-0338 or email to sifu@wahlumacademy.com. Chinese lion dance ceremony dates back more than a thousand years and has always been an integral part of the Chinese culture. The lion itself is regarded as a guardian creature coming from the mountains to drive away evil spirits, bring positive and celebratory energy, and give blessings to all who are present. Lion dances are most commonly seen at events such as Chinese New Year celebrations, banquets, weddings, and grand-openings. For these gatherings, it is widely believed that the Chinese lion dance will bring good luck, good fortunes, happiness, successes, and prosperity to the place, people, and businesses at hand. Two performers dance the colorful paper-mache lion head and the beautifully adorned fabric-body. The movements of the lion are often active and vigorous which is always accompanied by impressive and energetic music coming from percussive instruments including a drum, cymbals, and a gong. Depending on the purpose of the gatherings, skillful dancers can animate the lion to create various expressions to both entertain and tell a story of its presence as it carries out its job to drive away bad karma and give blessings. Chinese lion dance has deep history and many traditions within its art. Great skills and impressive tricks are demanding to learn and to master physically and mentally. The Chinese Lion Dance and Dragon Dance are two distinctive arts, most often-confused by non-Chinese to be of the same nature. They are both celebratory and are loved to be seen at any event. One traditional aspect of Chinese culture is the dragon dance. Chinese dragons are regarded as powerful, auspicious creatures that symbolize strength and good luck. They are heavenly and considered sacred. These auspicious creatures have long, serpent-shaped bodies that require many people to bring to life in a graceful and spirited dance. 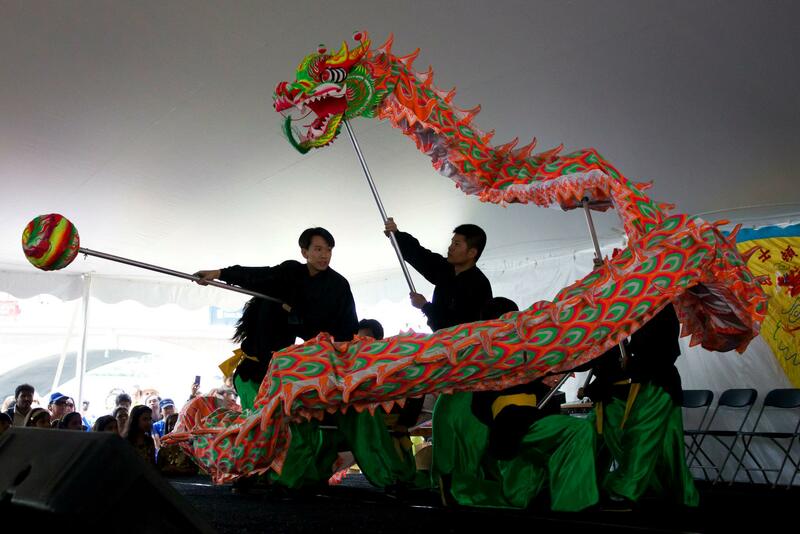 Unlike lion dances in which performers are hidden, the dragon is held up by poles which are used to manipulate the body of the dragon for animated motions and artful tricks. Lively music produced by the drum, cymbals, and gong accompanies the rhythm of the movements. The magnificent presence of a dragon dance at any event indicates that the gathering is important, grand, and has the auspicious blessings from the Heaven. Events that have hosted our Dragon Dance are: Chinese New Year celebrations, anniversaries, important birthday banquets, and outdoor festivals. 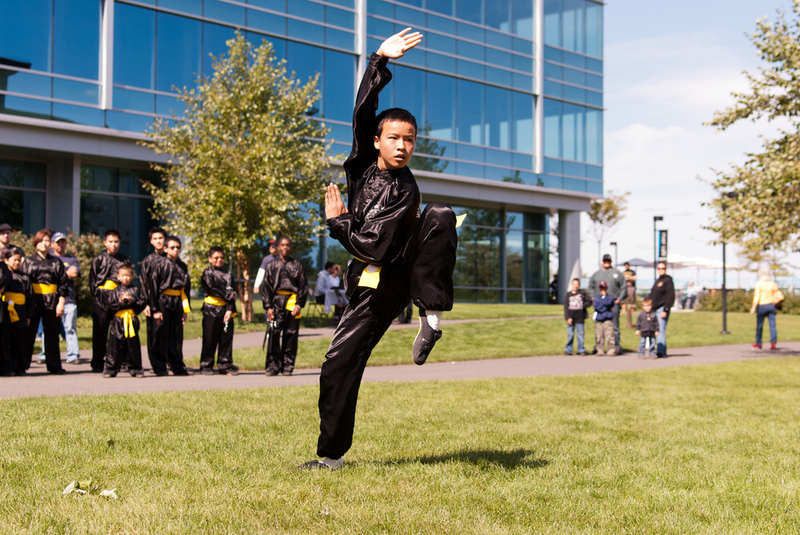 Wah Lum Kung Fu and Tai Chi has taken roots in the U.S. for more than 40 years. Grandmaster Chan Pui has created a strong legacy to promote, honor, and celebrate Chinese martial art through the many public and private performances of Wah Lum Kung Fu. We pride ourselves in the diversity of our teams in terms of age, racial/ethnic groups, and gender. We are honored to represent a strong and vibrant part of the Asian American culture throughout our communities. 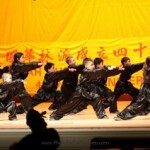 Our Kung Fu performances are always exciting to watch and are usually welcomed by very enthusiastic crowds. We demonstrate a variety of dynamic kung fu skills—empty hand forms, weaponry, and fighting sets—to share about what kung fu really means—traditions with passionate, fun, hard work. Our Adult and Youth Performance Troupes have demonstrated at countless events throughout the year. We are a ‘regular’ at most Boston Chinatown and Malden community outdoor events.